Admittedly, the Church does not have the best record when it comes to apologizing for its mistakes. However, the Church is made up of individuals who freely and openly admit their own brokenness and inability to redeem themselves by their own power. Regrettably, this admission does not necessarily entail a corporate willingness to repent of our corporate wrongs and brokenness. For example, for far too many years some who have claimed the Church's banner have also exhibited a virulent strain of antisemitism that persists even to today. The self-described followers of a crucified Jew have labeled Jews as "Christ-killers" or some other dehumanizing and ignorant epithet. This has not been good for either Jews or Christians because hate destroys those who is directed at and those who wield it. "True, the Jewish authorities and those who followed their lead pressed for the death of Christ; still, what happened in His passion cannot be charged against all the Jews, without distinction, then alive, nor against the Jews of today. Although the Church is the new people of God, the Jews should not be presented as rejected or accursed by God, as if this followed from the Holy Scriptures. All should see to it, then, that in catechetical work or in the preaching of the word of God they do not teach anything that does not conform to the truth of the Gospel and the spirit of Christ. Furthermore, in her rejection of every persecution against any man, the Church, mindful of the patrimony she shares with the Jews and moved not by political reasons but by the Gospel's spiritual love, decries hatred, persecutions, displays of antisemitism, directed against Jews at any time and by anyone." In this statement, the Church can be united in repentance for our personal and ancestral failures to live up to Jesus' calling. Jesus has called his followers to a sacrificial love and spiritual worship that cannot abide hatred and dehumanization. Language such as speaking of Jews as "accursed" or "rejected" cannot contain the seeds of love because of the brokenness of the communication. Instead, we must align ourselves with the "spirit of Christ" and learn to see ourselves as Christ's accuser--for, surely, our sin and brokenness are the great wound our loving Lord bore on the cross. If we can be united in repentance, then we shall learn that it is in repentance and humility that the Church finds power. If we can reject the posturing and pretending that says that it's not our fault or that we are somehow different and "better," then we shall be on the path to salvation. If we can admit how truly broken and sinful we are, then we might see redemption. If we can proclaim to our loving and merciful God how full of hell and nothingness we are, there might be heaven in our lamentation. But if we cannot be united in repentance, then we have no good news--no Gospel--to offer the world that so eagerly and desperately yearns for truth, love, light, and life. 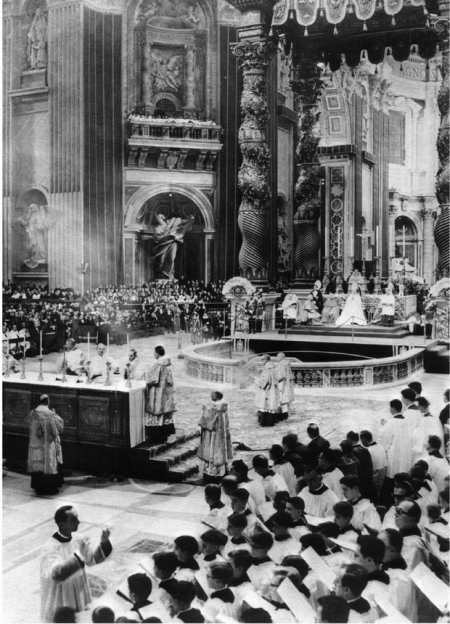 If we cannot embody the spirit of the Second Vatican Council--the same council that included a joint declaration of brokenness by Western and Eastern churches that resulted in the Great Schism--then there is no hope, faith, or love in us and we remain full of that which is destroying us: ourselves. Lord Jesus Christ, Son of God, have mercy on us--sinners that we are.